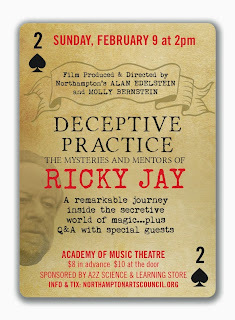 On Sunday, February 9th at the Academy of Music, the Northampton Arts Council will host an afternoon of history, deception, and magic with renowned illusionist Ricky Jay, including a screening of the film, “Deceptive Practice: the Mysteries and Mentors of Ricky Jay.” The critically acclaimed film, produced and directed by Northampton resident Alan Edelstein and Molly Bernstein, provides audiences a glimpse into the exclusive world of illusionists and highlights some of Jay’s best-known work. To round off the afternoon, special guests will on hand after the film to answer questions. “If you think about it, what makes magic different is that it’s inherently honest. You tell someone you’re going to deceive them before you deceive them. In some ways, that makes it more difficult,” says Jay in one of the documentary’s many interviews. This contradiction informs the film, as Edelstein and Berstein remain true to the documentarian’s mission of exploring and uncovering, while working with subject material that relies on concealment and a man committed to keeping secrets. But at the heart of both movies and magic is a great story. Edelstein and Berstein’s film tells Ricky Jay’s story, and through it the story of magic, in a way that will keep viewers fascinated from beginning to end. Jay’s career started when he was 4 years old, when he began learning the art of magic from his grandfather, Max Katz. Since then, he has studied with some of the best magicians of the 20th century and has lectured at museums and academic institutions across the country, including the Metropolitan Museum of Art, The Getty Center, Harvard and Brown University, and Amherst College. His firm, Deceptive Practices, co-founded with Michael Weber, has provided “Arcane Knowledge on a Need-to-Know Basis” to film, television and stage productions, including “Forrest Gump,” “Oceans 13,” and “Angels in America part 2: Perestroika.” Jay is also respected as a historian and collector of all things magic. He has loaned rare books, manuscripts, and memorabilia to museums and libraries across the country. And those who are not familiar with Jay’s work in these arenas may recognize him from the many movies in which he’s appeared, including several made by his long time collaborator David Mamet. 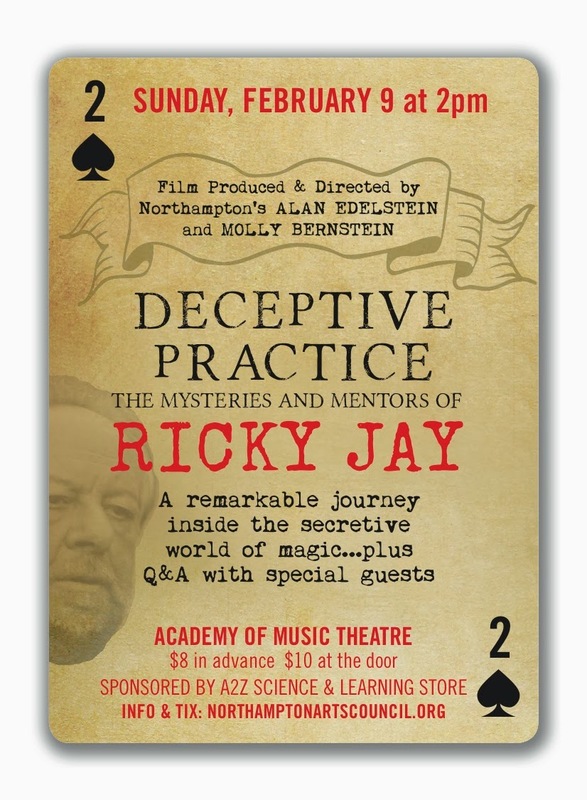 “Deceptive Practice: the Mysteries and Mentors of Ricky Jay,” will be shown as part of the Northampton Arts Council series “Four Sundays in February,” on Sunday, February 9 at 2:00 PM, at the Academy of Music, Northampton, MA. For more information, contact the Northampton Arts Council by visiting northamptonartscouncil.org or calling (413) 587-1269.